The WAT, Water Activated Tape (gummed paper), not only close the box but it locks it! It is the most safe and economic system to seal carton boxes. It is available brown or white, standard or reinforced and it is also printable with company logo. The tape must be used with proper dispensers which moisten (re-activating the glue) and cut stripes with desired length needed to seal the box. The gummed paper has many advantages, specially it definitively seals strongly the package, it is unaffected by extremes cold, heat, light or humidity, it has an easy and ecological recycling and saves material using the dispenser that cuts the exact length needed. 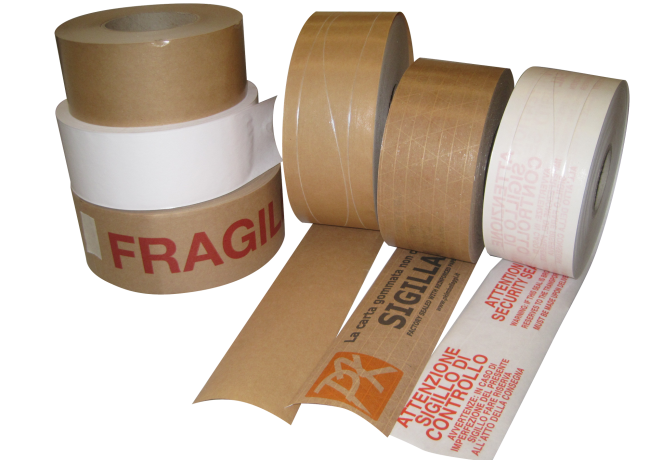 Gummed paper tape is the sole “tamper evident” system which guarantees the safety inside your boxes. The closure system could be with one stripe, with a cross and like “H” as shown in above images. The dispensers are manufactured in several versions, from the simplest manual PINWAL to semi – automatic lever operating units and electronic with buttons or pedal. Discourages theft - tape won't "pop off"